I'm really not sure why I woke up. But last night at 1:30 am I woke up. I did what I do anytime I wake up in the middle of the night. I go check on my kids. No clue why I do that, perhaps it was just a habit I got into when they were infants. I went into Tait's room to check on him. He was on the verge of sliding off his bed, so I went ahead and slowly pushed him back into the middle of the mattress. That was a mistake I immediately regretted. He woke up. Great. And now he was crying. Even better. Seeing as how his half-asleep cry session was my fault I snuggled up next to him to help him go back to sleep. Here is what you need to know about my son. He LOVES to play drums. His little arms are constantly banging out rhythms everywhere we go. Unlike most kids his age he doesn't care if his stuffed animals are in his bed or his blankie is next to him. 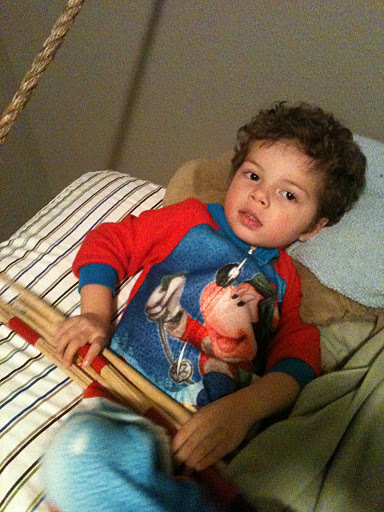 He sleeps with his drumsticks. Not just one or two, but he sleeps with however many he can find before we tuck him into bed. Last night he slept with six drumsticks. As I snuggled next to him he stopped crying. I tried to lay very still so he would drift off into sleepy bliss. The only problem was the six drumsticks. They were jabbing my face. He had them laid next to him on the pillow and I plopped my head right on top of them. It was really uncomfortable, but it seemed to be the ideal spot to snuggle Tait back to sleep. I laid there for about 10 minutes. Then he finally went to sleep. Why I laid there I was thinking about how it is 1:30 in the morning & the last thing I want to do in the middle of my groggy night is lay on top of splintered sticks. Finally when I could tell he was out I hopped out of bed, rubbed my scratched face and went back into my bedroom. Once in my bed I got under the covers & pulled the blanket over my head. Since being married I have slept with the covers over my face. Jady can't sleep if there isn't a fan blowing & I seem to wake up every hour with the need to drink a gallon of water if the fan is on. Jady promises that the fan has nothing to do with it, but I find it hard to deny the fan is the culprit. Either way, I started sleeping with the covers over my head. I laid there thinking about the sticks and the fan. The little things we do to serve the people we love. Somehow laying there on Tait's sticks and hiding under the covers from Jady's fan made me smile and think about how fantastic they are. I love the sticks and the fans even though they aren't my personal preference. Jady sacrifices things for me. Like not having a laundry schedule that runs with military precision ( or any precision for that matter). And when I am old and my joints ache my kids will sacrifice for me. To take care of me and make sure I have an extra cushy chair when I come to visit. It's just what you do when you love people. Sacrificing makes us love them more somehow. It reminds us that they are worth a bit of discomfort and a bit of having it our way. I have known so many friends who chose or rejected marriage based on the things they would have to sacrifice. Not the big important things. But the things like where they buy their clothes, what music they listen to and their preferred way of communication. They looked for who required them to change the least instead of who they could love the most. When we prefer others, we love others. When we prefer ourselves, we love ourselves. I'm not the best at this. I'm not even good at it. But I am thankful for nights of sleeping on sticks and the way they remind me to love.